(Corvallis, Oregon) – Images of Earth's coastal region are being beamed straight into a lab at Corvallis, Oregon’s Oregon State University, helping scientists monitor a variety of events in that ecosystem from a brand new vantage point, including things like plankton blooms or even oil spills (above: image of the Columbia River from the imaging system). It’s called HICO – for Hyperspectral Imager for the Coastal Ocean. It’s the first sensor in space made specifically for looking at the coastal areas of the planet, allowing scientists to better analyze human impacts and climate change effects on the world’s coastal regions, according to Curtiss O. Davis, an OSU oceanographer and the project scientist. This equipment allows scientists to see down through water as far as 50 to 60 feet below the surface, letting them map the ocean floor at that depth. This could help perform tasks such as track sediment down the Columbia River and even identify ocean eddies and currents. HICO was developed by the Naval Research Laboratory and installed aboard the space station in 2009. 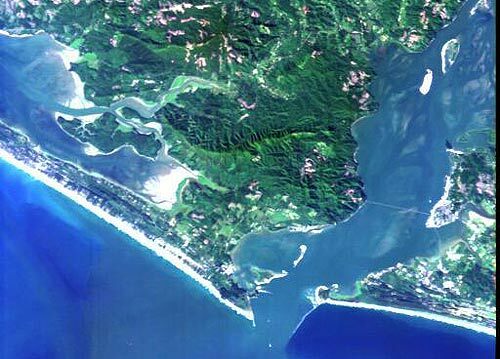 Images and data from HICO have already revealed interesting discoveries about areas all over the Earth, such as the Han River in South Korea, where large waves come from in the Straits of Gibraltar, as well as storm action and its effects on breakwaters and sand bars of the Columbia River. Davis hopes to look into the depths of the waters off Japan to look into the dynamics of the tsunami there in March. The space station orbits Earth about 16 times a day, which tends to allow for five or six good images a day of their target areas. Data files are huge, and weather and darkness can also limit use of the imaging system.